Massey, dean emeritus at the Anderson University School of Theology, is the son and grandson of ministers. He graduated from Cass Technical High School (1947), Detroit Bible College–later renamed William Tyndale College (1961) and Oberlin Graduate School of Theology (1964). 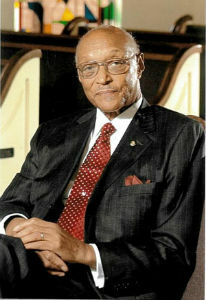 He received his doctorate from Asbury Theological Seminary (1972). In 1951, he married Gwendolyn Inez Kilpatrick, the daughter and granddaughter of ministers and in 2011 the couple celebrated 60 years of married life together. An active churchman, Massey preaches regularly in local churches and has preached in distinguished pulpits across America and in England, Europe, Egypt, The Caribbean, Australia, and Japan. In addition, he has been guest lecturer and preacher in more than one hundred fifty colleges, universities and seminaries in the United States and abroad. As a productive scholar, Massey has authored and edited thirty published books, many contributions to books by others and more than five hundred published articles in scholarly journals and popular magazines. In 2006, he was named by Christianity Today International one of the “25 Most Influential Preachers of the Past 50 Years”. A much sought-after lecturer, Massey has fulfilled many lectureships and although presently retired from formal long time assignments, he continues to serve faithfully. Dr. and Mrs. Arlo and Helen Newell created the Newell Lectureship in Biblical Studies in 1981 for the purpose of bringing a significant specialist in the field of biblical studies to Anderson University and the School of Theology on an annual basis. The Newell Lectures are one of the longest running lecture series in the United States. Dr. Newell served the Church of God (Anderson, Indiana) for many years as a pastor, editor of Vital Christianity (former national periodical of the Church of God), a Church of God General Assembly officer, and author of numerous books and articles. Dr. Newell continues his writing and serves as a Chaplain in Residence with the Anderson University School of Theology. Helen Newell also worked faithfully in the Church of God and in the Anderson community. She is a 1981 graduate of the Anderson University School of Theology with a Master of Religious Education. The Newell Lectures were created to honor Helen’s work at the seminary and in the Church of God. Anderson University is a private Christian university in central Indiana. Anderson University continues to be recognized as one of America’s top colleges by U.S. News and World Report, The Princeton Review, and Forbes. Established in 1917 by the Church of God (Anderson, Ind. ), Anderson University offers more than 65 undergraduate majors and graduate programs in business, music, nursing, and theology. This entry was posted in All Church of God, Colleges & Universities and tagged Anderson University, AU, James Earl Massey, Newell Lectures, School of Theology. Bookmark the permalink.